Tile and stone are ideal materials for bathroom flooring. 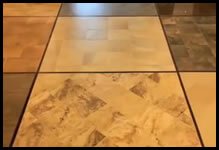 Ceramic tile, porcelain tile, marble, limestone, travertine and slate bath floors provide beauty, durability and low maintenance. Granite, marble, sandstone, quartz, limestone and soapstone are all excellent materials for bathroom countertops. Each type of stone has varying qualities that make it suitable for bathroom countertops, including scratch-resistance and stain-resistance. Glass tile, mosaic tile, metal tile and travertine are ideal materials for a bathroom wall or backsplash. Both functional and decorative, a bathroom wall tile and backsplash is a must for your luxury bathroom upgrade. Westchester House & Home is your destination for bath tile and stone, including ceramic tile, porcelain tile, glass tile, mosaic tile, and metal tile, as well as marble, granite, travertine, limestone, sandstone, slate, quartz and manufactured stone. Our Mount Kisco showroom is filled with all types and styles of bath tile and stone to meet your decorating needs.